REquipment accepts gently-used DME that is less than 5-6 years old. We are currently accepting power and manual wheelchairs, scooters, sling lifts, portable ramps, tub/shower chairs, rollator walkers, adapted strollers, standers and gait trainers, and specialty cushions/mattresses. Equipment should be in good condition or easily repaired. Exceptions may be made with regard to the age or condition of the equipment if it is in high demand, of high-value or unusual to access. We are not able to accept hospital beds of any kind, any built-in-place ramps or stair lifts, braces, CPAP or other medical machines. 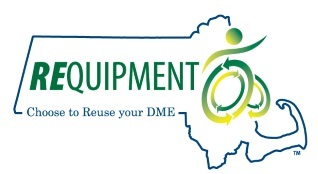 Download our Guide to DME Reuse Resources (WORD) for other donation options. Or browse Other Loan/Reuse Options (a MassMATCH webpage). Accepted donations can be dropped off at our Reuse Centers or we can pick up large equipment at no charge. You will be asked to sign a form that confirms you own the DME and have the right to donate it. We provide a donation receipt to document your donation for tax purposes. If you have DME you would like to donate to help someone in need, please complete this on line DONATION FORM. You may also call REquipment Customer Support toll free at (800) 261-9841 or email info@dmereuse.org. Thank you for choosing to reuse your DME!